of quiz questioning and antique analysis. So, the aim of the game is to amass the most valuable collection. Now, an antique must be well-loved and have a patina of age. Talking of which, our expert today is David Harper. -Some things get better with age, Fern. David, please tell us what lots we're playing for today. and then finally, a coin. of one of their chosen items. to our worthless lot, which is the lot to avoid. So, let's meet our teams. I'm Ian and this is my darling wife, Vicky. Oh, a lovely happy ending. We'll find out a bit more about you later on. Welcome though, team one. Hello, I'm James and this is my father, Nigel. We're from West Sussex and we love haggling at boot sales. Oh, I like that too! Welcome, team two. I'm Rachel and this is my friend Kirsten. -And we like travelling the country looking for antiques. But could they are separate antique from shabby chic? Let's see. -Look at this, an Aladdin's cave. There's just some really unusual things here. I do like that a lot. It looks like a typewriter. Shall I see if I can open it? Typewriter? Never heard them described as a typewriter. Oh! Who is this guy? 1950s pedal car, I remember these. -I know who would like playing with that. I've no idea about that, have you? -Oh, wow. Lithograph! Sketches in Scotland! "North entrance to Rosslyn Chapel." Now I'm going to leave you this one because this is your field. I really have nothing to say about the shotgun. Is it a nice stock? It's not gold, I don't think. Is it gold, is it plastic? It's definitely... That's costume jewellery, isn't it? It's a George II crown. -The picture's still clear, isn't it? Which makes me feel as though it maybe isn't that old. -Quite a fancy gravy boat, isn't it? Walker & Hall, Sheffield, England, '76. That's right, always have a look at the bottom. Is that a watch, is it a lighter? You would buy that if you saw it in an auction. Very Deco looking, isn't it? -I'm not a fan of that. It could be Murano glass. I thought they might know. -it might be very valuable, I would have thought. It's not a book I've heard of. -That's a sort of pendant. But I think they're playing polo, which is interesting. Pretty, it's quite old. Look at the filigree around the side. These are nice, if they're genuine. Do you think old or just badly made? I don't think they're that valuable. -For the top lot, we'll go for the writing slope or the car. In the bottom lot, definitely the necklace. The shotgun's the highest priced item. And the worthless item, potentially the bowl. and we're writing off the necklace as worthless. OK, let's leave it there! as they walked around in there, David? Quite surprising, actually. A lot of good knowledge. Not always in the right order or on the right objects. -However, the knowledge was great. Now, how do we arrive at the valuation of the lots? in auction when it doesn't include the auction fees. It could be worth thousands or it could be worth nothing at all. OK, pickers. Please make your first pick now. Ian and Vicky, you've gone for the shotgun. and Rachel and Kirsten have gone for the writing slope too. So, there's a battle on our hands already. Quizzers, fingers on the buzzers, please. Here comes question number one. with Making Your Mind Up? It is Bucks Fizz, well done. The writing slope is yours. Pickers, would you like to choose something else, please? Ian and Vicky have gone for the shotgun again. and Rachel and Kirsten have gone for the toy car. in Some Like It Hot? I'm going to have to tell you. Ian and Vicky have gone for the book. Rachel and Kirsten have stuck with the toy car. Here we go, question three. Sri Lanka is located off the south coast of which Asian country? I'm sorry, you are frozen out of the next question. James and Nigel sticking with the figures. Rachel and Kirsten have gone for the watch and lighter. In US currency, how many cents are equal to a nickel? -You are frozen out but it means that Ian and Vicky are back in. So, Vicky and Nigel, please pick something. Ian and Vicky, gone for the shotgun again. -James and Nigel really want those figures. -Correct, the shotgun's finally yours. Pickers, please pick something else. James and Nigel the silver gravy boat. And Rachel and Kirsten, the pendant. In The Flintstones, what is the name of Barney Rubble's wife? -Having such a bad day! Rachel, I'm sorry, you're frozen out. Vicky and Nigel, your chance to pick again. Ian and Vicky, you've gone for the figures this time. James and Nigel sticking with the gravy boat. Which popular English cheese is named after the caves in Somer...? the caves in Somerset where it was originally stored to ripen? -the gravy boat is yours. Final question. You're all in this one so pickers, please pick. Ian and Vicky have gone still with the watch and the lighter. James and Nigel have gone back to the figures. Rachel and Kirsten have gone back to the watch and the lighter. A short form of which sport is known as pitch and putt? let's see how we're doing. Well, Ian and Vicky have the shotgun that they really wanted. the figures and the gravy boat. but don't worry, there's plenty of time. Ian and Vicky, tell me a bit about yourselves. -You met each other through the Lonely Hearts column. -And who put the advert in? "Must like children and animals." -We both have both, yes. So, what was it that made you fall in love with Vicky, Ian? Her smile and her personality. -And she laughs at my jokes. That's it. Well, it's very, very nice to have you here. I think we'll stick with the shotgun. You do like this shotgun. OK, let me tell you everything I can. but there are a few handling marks on the metal. this item would definitely add a bit of firepower to your collection. It's a lot stocked with two smoking barrels, baby! -Exactly, does that help you, Ian? Now, James and Nigel, tell me something about you. James, I hear you think your parents are hoarders. and china hutches full of absolutely everything. looking at antiques and everything along those lines with them. when you were very young, working at a National Trust house. I did. I started when I was 14 as a guide at our park in Sussex. And James was quite right, actually. I'm afraid I collected from that age. But your wife is understanding, she's the same? and say that they don't necessarily always see what comes in the house. -I'll let you into a secret. Nor do husbands. -I think I'd like to know about the book if possible, please. It's an account of the events leading up to World War II. It's an extremely good copy. with a little hole maybe halfway down. during the year of its publication. other than a very scarce library issue in 1971. Team three, Rachel and Kirsten. -Rachel, you say you like a flask and an adventure? and the dog in the back. Lovely. And, Kirsten, you collect Ladybird books. I do, for my daughter, Eve. that looks like our cat Tom. They help children learn how to read when they're small. Lovely. Well, which lot would you like to know more about? -We would like to know more about the toy car, please. this pedal car comes from their Monte Carlo range. white wheels, which is actually quite rare on a little toy car. The bodywork is good, it's nice and solid. This is quite a rare model. But will this car hold the key to a valuable collection for you two? It's time now to play round two. will again try and secure it by answering correctly. a question either from the landmarks category or kings & queens. Ian and Vicky, you're up first. So, Vicky, what's your lot? -We'll go for the book. So, Ian, landmarks or celebrity gossip? The Cerne Abbas Giant is located in which UK county? West Country, yes, but it's Dorset. OK, I'm so sorry, you do not get the book. Nigel, your turn to pick. -I'd like to go for the book as well please, Fern. Landmarks or celebrity gossip, James? Why not? Here we go, here's the question. In 2016, Jerry Hall married which media mogul? Rachel and Kirsten. Kirsten, what would you like to pick? We would like to go for the watch and lighter, please. Watch and lighter. Human body or kings & queens, Rachel? -Oh, tough decision. I'll stick with human body. connects the humerus to the radius and ulna? The watch and the lighter are finally yours. There we go. Now, teams. they get to choose the category which your quizzer must face, OK? So, Ian and Vicky and Rachel and Kirsten, you're safe. James and Nigel, you are not. Ian and Vicky, do you want to pick from the grid or steal? We'll pick from the grid. The book again. OK, landmarks or celebrity gossip, Ian? Er, landmarks didn't work last time, so we'll go landmarks. what is the name of the world's highest waterfall? -Vicky knows this, I think. Yeah, she does. It's not coming? OK, Vicky, would you like to tell him? -It is the Angel Falls but you don't win the book. I think we'd like to pick the book please, if we may. That book is really... You've set them alight with this book. -I can't help it, can I? OK, landmarks or celebrity gossip? A pyramid designed by IM Pei sits outside which museum? Correct! The book is yours. What do you want? Pick or steal? -We'll go for the car, please. Landmarks or kings & queens? I'll go with kings & queens. OK, here you go, here's your question. Eleanor of Aquitaine was a Queen of France and which other country? Correct! The toy car is yours. about that, there we go. Going to start with Ian and Vicky again. Pick or steal. -And we're going to steal...the book. you'd like Ian to answer. I think we'll go celebrity gossip. at an awards ceremony in 2009? Well done, James and Nigel. You have successfully defended the book, excellent. And it's your turn now. Pick or now you can steel as well. I think, Fern, I would like to steal the toy car, I'm afraid. That's not made her happy. what category are you going to give James? -We're going to go for landmarks, please. Rachel and Kirsten, pick or steal. I think we will go for the pendant, please. Rachel, human body, celebrity gossip? and hopefully not make a fool of myself. Somnambulism is the formal name given to what disorder? A burst eardrum, it's an entire guess. That came left of field. OK, the pendant is not yours. It's the end of the round. Let's see how the collections are looking. the figures, the book and the toy car. Rachel and Kirsten have the watch and lighter. So, David, which pair is leaving us first? Oh, you two, you tried so hard! -It's Rachel and Kirsten, I'm so sorry. Oh, that's very, very sad. the watch and the lighter leave the game too. -how much your watch and lighter are worth. You really did like this, particularly you, Rachel. You said it was handy, I think. I mean, handy? More like dangerous. you check the time, you set your trousers on fire! No wonder they didn't make very many of them. But this thing, it's a novelty item. It was an item that was produced during the 1920s in America. the cigarette lighter and the pocket watch. blue steel hands and a nickel-plated face. -It's worth £150, so well done. Rachel and Kirsten, it is time to say goodbye to you. It's been a joy to meet you and have you here. First of all, let's start with the lithograph. Based on a 19th-century piece by the Scottish artist Samuel Swarbreck. the artist also has works that are included in the Royal Collection. The feature of this lot is Rosslyn Chapel. to Freemasonry, the Knights Templar and even the Holy Grail. What does that make it worth? -A shocking 30 quid. Well done! Well done. Get rid of that one. Right, next, we have the Murano bowl. Well spotted, I think you all mentioned that it was a Murano. Funky thing, this is a glass splash bowl dating from the 1960s. hundreds of years and they're still producing it today. and it became incredibly popular. So, what does that make this one worth? -It's 50 quid, well done. It's a textured gold with a braided rope design. It has a trigger catch and is in excellent condition. -Hmm, you've blown that one. -OK, this is the pendant. on a mother of pearl background set in gilt. but it's unlikely to be of anyone of any significance. You all liked it. Nobody chose it. You were right not to choose it. Got rid of the worthless one. Now, they were produced between 1660 and 1685. This is the first issue hammered coin. And this particular coin was hammered in 1679. Now this means, Fern, that this coin was struck by hand. mass production machine-made coins were introduced. And look at it, study it. This coin is fully round. It's not misshapen and is considered to be rare. So, what is a quite rare, very good Charles II silver coin worth? -It's the top lot, £2,500. -Yes! Nobody mentioned it in the game, nobody. Wow, that's very bad news. but not so good that we've lost the top lot. So, teams, you now have one last chance to pick our expert's brains. So, which lot do you need to know more about? Ian and Vicky, what would you like to know about? It's a French Boulle writing slope, you picked up on that, Nigel. This slope was manufactured somewhere around the 1860s. which I think adds a lot of character, in actual fact. and an area for storing papers. And it comes with its original inkwell. -But, Vicky, does it have the charm to make it one to watch? Fern, could we ask more about the Walker & Hall gravy boat, please? OK, this is an unusual sterling silver gravy boat. central vessel which is surrounded by hot water to keep the gravy warm. because of the engraved design. as other larger silverware used on the dining table. So, David, which pair has the most valuable collection? which were part of this classic British franchise? -or do you want to pass it to Ian and Vicky? First, OK. Let's have a look at the answers. Nine of those are correct, three of them are wrong. Obviously, you've got to avoid the wrong ones. So, James first. Carry On Up The Khyber is a film. It's green which means it's correct. Well done. Correct. James, pick an answer. Is correct! Oh, it's getting harder now, isn't it? Correct. Nigel, give me an answer. I think Carry On Behind. Carry On Behind, is that correct? It is! Of course it's going to be. Vicky, give me an answer. That was not correct. Let's have a look at the other wrong answers. And the made-up ones are Carry On Kissing, Carry On At The Beach. That means you can steal a lot from your opponents. but we'll go for the shotgun. Now, Ian and Vicky. It's your turn now. ..according to the 2011 census. -Go first, OK. Let's have a look at the answers. Ian, you go first. Give me an answer. OK, let's see where all the other wrong answers were. Well done, Ian and Vicky. It means you can now steal a lot from your opponents. OK, third and final question. This is for James and Nigel. as they are displayed on the periodic table. First, OK, let's have a look at the board. James, give me an answer. Of course it is, it's oxygen. Well done. -I'm hoping that B is beryllium. It is correct, well done. Vicky? -Xe. Let's have a check. That was xenon, in case you didn't know. James? OK, let's see where the other false ones were. But maybe not, it's James and Nigel. Ian and Vicky, fantastic game play but commiserations to you both. You didn't create a valuable enough collection. -what did you make of their collection? And I think everybody wanted that writing slope. Now, let's just have a quick look at the Winston Churchill book. Everybody wanted it and again, you two, you bagged it. And we know that Winston Churchill was a prolific writer. and its value is actually a shockingly low £120. bearing in mind you only had two items, £720. You've played so very well. -Thank you, we had a great time. I think we're torn between the gravy boat and the figures. But I'm not entirely sure they're the most valuable. -I think we'll probably go with the gravy boat. David, please can you tell us what they have rejected? Gosh, this is a really nerve-racking moment. So, we're going to talk about the shotgun. James, you know your guns. So, well gotten rid of. And next, we move on to, I think, my favourite object. I just think this little car is drop-dead gorgeous. You knew all about it, you knew it was popular. -So, as nice as it is, good to get rid of it. by the Bow Porcelain Factory. Very difficult to determine, no maker's mark on the base. Nigel, what can they be worth? I would imagine that you'd be paying over £1,000 for them. -Yeah, they are worth £1,500. OK, but it is the gravy boat that is your chosen lot. You've won the value of this. I think about 600, something like that. Yes, I would say about 600, something like that. If it was 800, I wouldn't be surprised. for our mystery lot which could be worth a lot more? Or a little bit less. Come with me. James, Nigel, this is your beautiful gravy boat. Now, you cannot touch this item, chaps. -and napkin rings from British Airways' famous Concorde. You've clocked that already, Nigel. they're boxed, they come as a pair. The menu is from Concorde's first ever commercial flight. but is in general very good condition. of Concorde took place on January 21st, 1976. As British Airways flew from Heathrow to Bahrain. This is the way you travel, Fern? This is normal to you. -can't imagine it today, offered Havana cigars. It's a piece of history here. I, I would say how many seats are there? and how many napkin rings there are. I'm saying how many seats are there? That's how many menus there are. and I know it would appeal to an awful lot of people. we actually wanted in the first place. Is that OK with you? Is that a joint decision? -He said it, he says yes. Tell us what they've rejected. -Oh, guys. Oh, my gosh. You've got to think of the market as it is today. You know, it's all about 20th-century design. You touched on all of the right words. Iconic, you know, Concorde. That is a rare thing. -That's why we can't handle it. Please don't do that to me at my age! "He's going to follow it by the word thousand." -Well, you've settled on the gravy boat. David, let us know how much this is worth. OK, well, I mean, this gravy boat has caused quite a stir. but I think your valuations are absolutely remarkable. You said £6-800. You were bang on but at the top end of the estimate. You're going home with £800. and such a great show, thank you very much for that. -You go home with £800, £400 each. -I hope you blow it on something fantastic. -all your expertise, as usual. 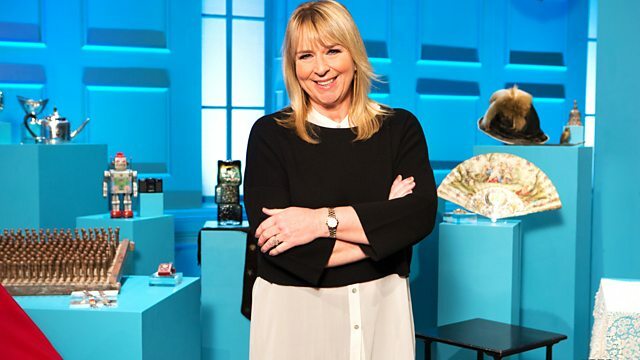 David Harper assists Fern Britton, giving her expert insight into the wonderful world of antiques and collectibles as the three pairs of contestants answer general knowledge questions, hoping for the chance to add antiques to their collections and win the game.